Special thanks to Classico for sponsoring this post. As always, all opinions are my own. These delicious, extra cheesy, Italian sausage stuffed shells use a few short-cuts to make this dinner so fast and easy to make. A sure crowd-pleaser! I’m not sure if the babe has a favorite shape of noodle, but the toddler LOVES the small shells. So when I grabbed the jumbo shells for this very dish, he was beyond excited about how big they are. A few jars of Classico® Tomato & Basil Pasta Sauce and the boys were practically jumping out of the shopping cart in excitement. While it’s not too hard to get them excited over simple things, I’ll take it as a mom win. 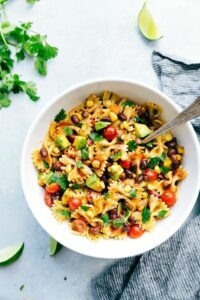 I mentioned this dish is ridiculously easy to make and there are a few “short-cuts” along the way. The main “short-cut” is the Classico® Tomato & Basil Pasta Sauce. 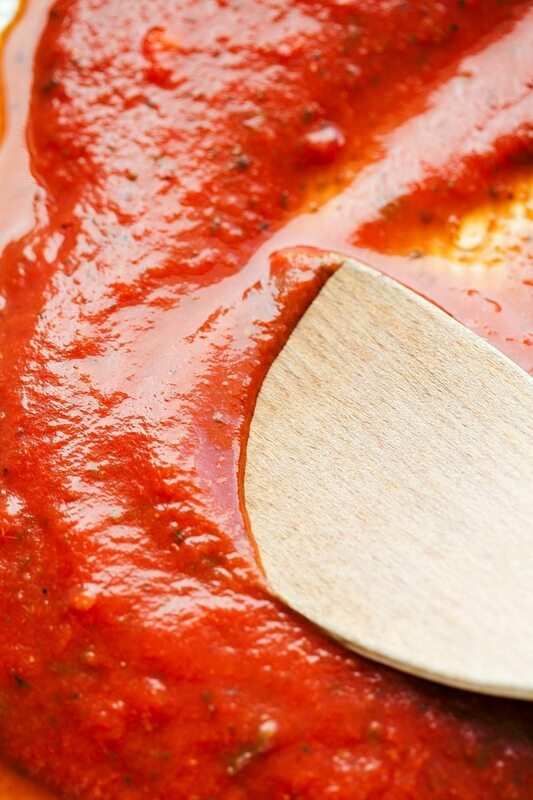 This sauce will give you an authentic Italian flavor without the effort of making a sauce from scratch. Thanks to the flavors and seasonings, the sauce really is the star of this dish! Classico® Pasta Sauce is inspired by regional Italian sauces and you’ll definitely taste that in the final dish. Because this sauce has so much flavor, you’ll notice we aren’t adding a whole bunch of additional seasonings and spices to this meal. Another “short-cut” is using a seasoned cream cheese. 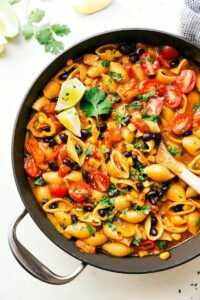 No need to chop onions for this Italian dish! You’ll use green onion & chive cream cheese which brings out the traditional onion flavor in an Italian dish without the extra work! And finally, the last “short-cut” is pre-shredded cheese. I’m usually ALL about shredding cheese off a block, but for this recipe it really works to buy pre-shredded. 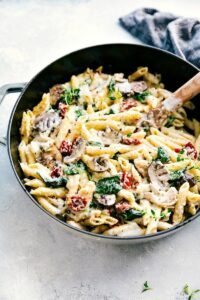 You’ll grab an Italian blend so it only further intensifies the Italian flavors in this dish. With a prep time of no more than 20 minutes, you’ll have a fresh and delicious dish the whole family will love! 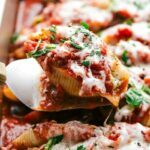 These delicious, extra cheesy, Italian sausage-stuffed shells use a few short-cuts to make this dinner so fast and easy to make. A sure crowd-pleaser! Heat oven to 350 degrees F. Cook the jumbo pasta shells according to package directions. Drain, rinse in cold water, and set aside. In a large skillet over medium-high heat, add the olive oil. Once the oil is shimmering, add in the garlic and stir for 30 seconds or until fragrant. Add in the ground beef, Italian sausage, and Italian seasoning. Mix and break up the meat. Cook until browned and then remove from the heat and set aside. In a 9 x 13 baking dish, spread 1 cup of the pasta sauce. Set aside. In a large bowl, mix cream cheese spread, 1 and 1/2 cups of the Italian cheese, the Parmesan cheese, egg and cooked beef/sausage mixture. Spoon a heaping tablespoon of the mixture into each shell. Place the stuffed shells over sauce in prepared pan and then pour the remaining sauce over top, covering the shells completely. Cover the pan with foil. Bake for 35-40 minutes. Sprinkle with the remaining 1/2 cup Italian cheese and cook for 10 more minutes. Remove and top with fresh parsley and basil if desired. hey girl- this looks so yummy! y’all have a great weekend! 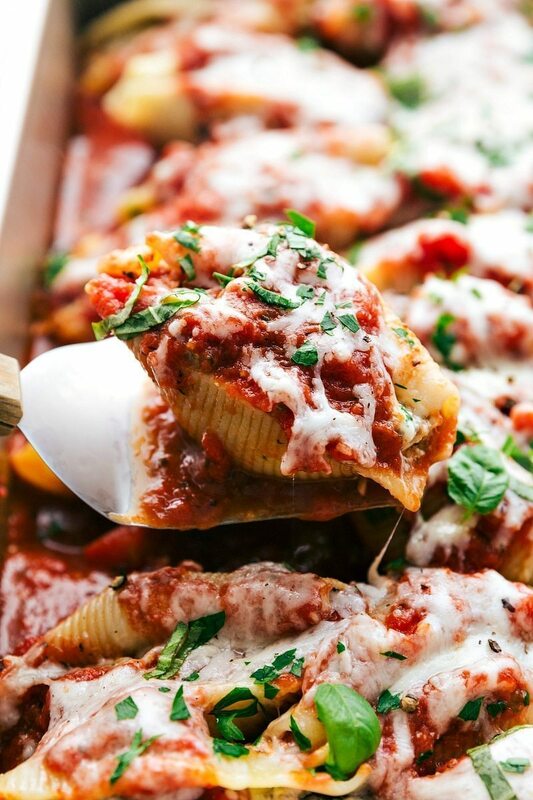 Oh my gosh, these italian sausage stuffed shells look so good. I love the shortcuts. Thank you for sharing the recipe. Do these freeze well as a make ahead meal? They look delicious. Thank you Toni! Unfortunately I’m not sure about freezing these; I haven’t tried it personally. Wish I could be of more help! Came out super good! The whole fam loved it ????? ?